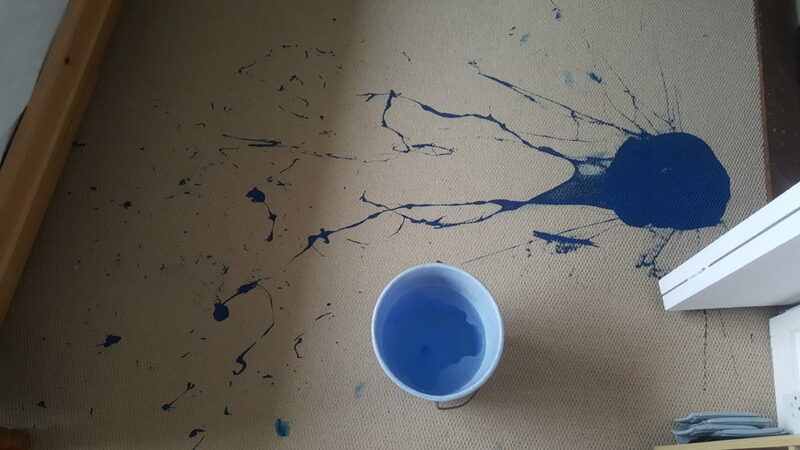 One morning this month I learnt a few valuable lessons; albeit the hard way at the hands of a tin of blue paint. It’s a stupid place to keep it. Turns out it could fall and if it does it might pop open and redecorate your bedroom. Who knew?! I had plenty of time before I had to be out the door, however, I was rushing and have to confess to a little laziness. Rather than remove the other items in my way I tried to just squeeze my bag past it all. Perhaps it’s time to try slowing down a little and being more purposeful rather than cutting corners. Give things a little more time and attention. I don’t necessarily mean this in the sense of storage solutions, I have very limited space for quite a lot of stuff but it links back to the laziness factor. A few of the items in my wardrobe had been tossed there as I couldn’t find them another home and half the items that were out in the blue firing line wouldn’t have been caught up in it if they were also away where they were supposed to be. Less about re-organisation and more about the time and effort I put into it. If I had prepped my bag the night before I dare say this would have been avoided as I wouldn’t have been rushing. The biggest and more profound take away for me; the paint shouldn’t have even been there. It should have been painted onto a canvas backdrop about 6 months ago. I have been working on setting some goals for this year both personal and within my business and the beautiful artwork on my carpet now acts as a big visual reminder to stop hesitating. There are so many things I put off doing with any number of “reasons” that I should jump to rather than waiting to begin. So there are a few lessons that I hope you can take away from my blue blunder without a similarly stupid experience to accompany them.